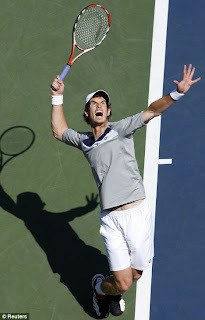 Andy Murray, pride of the UK, is playing tonight in the finals of the U.S. Open. Andy took down his Wimbledon nemesis, Raphael Nadal over the weekend and now has only living-legend, Roger Federer, standing in his way. Previously, I feted Andy in this very blog. I didn't know much about him, I must admit -- and such ignorance has come back to bite me. Seems, Andy is *not* a very nice person, and in a week packed with two England footie qualifiers for the next World Cup in 2010, I just discovered that Andy, pride of the UK, tends to cheer on anyone but England! He even wore the shirt of England's opponents' Paraguay during the 2006 World Cup. Now I understand young, silly Andy is from Scotland. And personally, with Scottish *and* English heritage of *my own*, I also know that there are some issues (to put it nicely) between the two countries. Perhaps Andy feels that he would be insulting his Scottish-ness to play nice with England on the world stage? I think it just shows what a petty, imbecile he is. Britain as a whole has wrapped Andy in the Union Jack and made him their own...and for thanks, Andy regards England as crap. So, I hope Roger mashes Andy into the NYC pavement at the Open and we don't have to see his smug face hoisting the trophy this evening. Twerp! Eugh!! Andy Friggin Murray needs a great big slap and I would be more than happy to give it to him. I don't even care that he's anti- English, it's everything else about him that drives me insane. He is just a cocky, tw@t head that needs a reality check. He should be looking at players such as Federer and realise that class can get you a long way. No matter what nationality he is, he will always be a c**k and I cannot stand him. So glad he didn't win.